William Stewart, camera in hand, is often to be seen hiking through parks, urban jungles, farmland or exploring untamed remote wilderness as he follows the light and the seasons. And trees, young and old, amongst ancient ruins, bordering fields and rivers. In urban landscapes they form a backdrop to our lives, for many of us so present that we give them barely a passing glance. His photographs draw attention to these trees that surround us, sometimes in inaccessible places, other times on a street corner you might walk by every day. 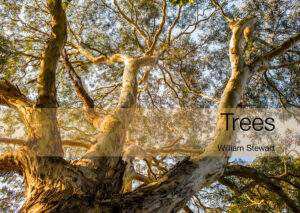 The constant presence of trees forms the theme of this book; a photo essay paying homage to the trees in our lives. “Trees” is testament to that. William Stewart captures the natural, the beautiful and the detail. And yet the images take us beyond the botanical into the realm of inspiration that trees invoke and the stories they tell. For more information see williamstewart.me. Can be purchased directly from Albumen Gallery. For those interested in book production, there is also a post, On the Making of Trees. Whats the ugliest part of your body?